We feel very lucky to live in an area with an excellent and diverse choice of schools and with a wealth of opportunities for work. We value the high education level of this area, and the rich and extensive cultural life here. At the same time, we find that the daily life we have lived over the past few years has morphed into a fairly stressful “rat race” existence. Life is more hectic than we hope it would be, and we seem to be left with little time for leisure, quiet reflection, and fun with our kids. We are looking to change that. As you know, time passes quickly. Assuming our kids go to college, we will be together as a family only five more years. We are not presuming that our children would want to cruise with us in their mid-teens. So if we are going to cruise as a family, now is the time. Additionally, assuming we continue with traditional schools, Cash in only a year (and Nicole in three) will enter high school where “every grade counts” and where they have no time. This leads them to college where “every grade counts” and they will have no time. Then … career? There is plenty of time to get stressed and serious about life. It shouldn’t have to begin now. totally satisfied that our children’s needs are being fully met. The traditional setting is limited in the ways that it can individualize learning. They’ve both done some amazing things, but we also find other ways in which we feel the schools fall short. Both are growing bored with some aspects of school. Cash is frequently frustrated that his homework schedule does not allow him the time to devote to his other interests. We do not want their inherent love of learning and excitement for interests squelched by years of drudgery and/or high stress. We are finding that we do not have the financial resources to do the kinds of things that we think will benefit ourselves and our kids, most notably travel. We have tried to be modest when it comes to material goods – but our house is the big exception. We want to trade that in, and enrich our lives with new experiences rather than things. We want to live meaningful lives. We hope to create a life of joy, deep and loving relationships, growth, adventure, productivity, and meaning. We want to take charge of these goals, and actively pursue them. It has been hard to keep these ideals in the forefront, as they are easily subsumed by the details of daily existence. Life here is still very good, and we feel it is important to find meaning and happiness whatever the circumstances, but we feel that breaking free of this traditional lifestyle is a great chance to open ourselves to a different perspective. We hope this will broaden our understanding of the big world we live in and find insight into other ways to live. It will offer our kids the chance to participate in their own education in a way that is highly personalized, deep, context-driven, intrinsically-motivated, and fun, while fostering independence, resilience, and responsibility. This voyage is a chance to truly model the ideals we talk about. We want to live the life we envision, not just talk about it. 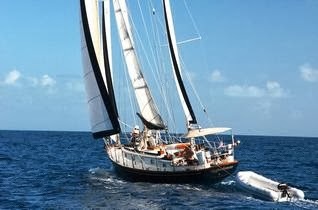 We are all excited for the chance to live and travel aboard a sailboat together as a family. We are aware of the downside and of the trade-offs it will require. But we believe the experience will be worth the sacrifice, and we are willing to work to make it a fantastic adventure! I am SO SO thrilled with what you're doing. It is VERY right! But. If I may make comment on the last two lines of your second paragraph...what I hope for you all is that you will (especially the kinder) come to know that there is NO time to be stressed in life and that living life seriously and wholly is excellent-I take the living of my life very seriously, but have had a ball doing it, and wouldn't change a thing.And the last sentence of that paragraph? Stress should NEVER begin or be a part of our lives, at least not as an ongoing, head-rearing kind of thing. I think if we make ourselves available to the joys that life offers us on a minute to minute basis, we will see there is no place or room for stress. The children sound so happy and I love reading their views. I also FULLY expect to see you in Coinjock this autumn. How tall IS that mast? If not the ICW, then at least call me when you get to the bottom of the Chesapeake. Annie Caie and I should be home by midOctober. Keep in touch. Greg has my email and number. Sail on in the Close Quarters of your wonderful new home into the wide open world. Rox and Compass Rose, the new First Mate. Is there a way for us 'Commenters' to post pics of our own? You can post an image in these comments, but the image has to be on the web somewhere. In the comment, you enclose the image URL in these tags [-im] [-/im] (remove the dashes). For example, [-im] http://site.com/image.jpg[-/im] (again, removing the dashes). If this sounds like gobbledegook, send me the image and I'll send you back the code. Love to see you in Coinjock if we go south that way. Our masthead height is 61' so we should be good (though we'd still wait for low tide the first couple of 65' bridges). In the meantime, safe sailing to you and Annie Caie!